A body found in a property in Bo’ness is believed to be missing Bo’ness man Arnold Mouat. Police had been hunting for the 64-year-old for four weeks. The tragic discovery was made at 2.45pm yesterday in Panbrae Road. Mr Mouat was last seen on July 7 in a property in the same road. How officers handled the case has now been referred to the police watchdog. Police said the body has yet to be formally identified but the believe it is the man they have spend the last month looking for. Members of the local community had also helped officers search areas where it was thought Mr Mouat, a keen walker, may have been. The death is currently being treated as unexplained, however the circumstances are not believed to be suspicious. A report will be sent to the Procurator Fiscal. 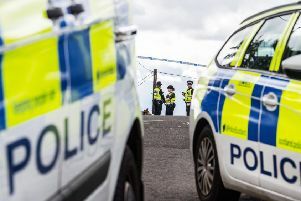 Superintendent Martin Fotheringham of Forth Valley Division said: “This is a tragic set of circumstances and our thoughts and sympathies are with the Mouat family as they come to terms with their loss. “Following a review of our response to this incident, Police Scotland has referred this matter to the Police Investigations & Review Commissioner. “I would like to thank those members of the public and media who responded to our appeal for information, in particular those who assisted with searching for Mr Mouat.